Synopsis: The Green Bay Packers legendary NFL receiver, all-time receptions and yards leader for the Green Bay Packers, and Dancing with the Stars champion looks back on his life and career. My review: I am a big Green Bay Packer fan and that is why I chose to read this book. 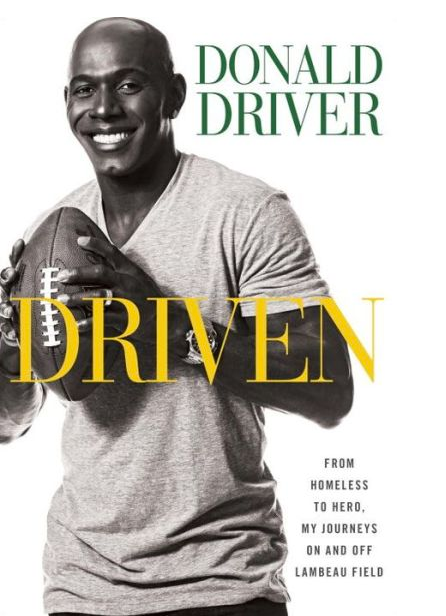 Donald Driver was a great player for the team so I thought it would be nice to know more about him. This book tells the story of how he overcame the obstacles of growing up in a not so great lifestyle to become one of NFL's greatest players. I will say the book started a little slow for me but it quickly picked up and I read this book in just a few days. I learned a lot about Donald and a few more things about the Packer organization that I did not know. It also talked about a couple of things that are sore subjects with me - like Brett Favre's leaving and it happened just like I had read other places and not the way the media wants you to believe. Even though I found out a few things about the organization that I do not like I will still be a fan as the person responsible for the issues I have will be gone from the team one day. Donald is a very strong person, devoted family man, devoted team mate and a good person. I recommend this book if you want to read a good biography or a football fan. Synopsis: In 1820, Stephan Yost is the resident carpenter of Schooley's Mountain, New Jersey's fashionable resort. 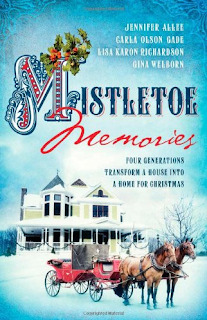 When he finds himself enamored by spirited Annaliese Braun, he vows to build her a home by Christmas. Heartbroken Civil War widow Marianne Plum thanks the Lord very day that she never had children, especially a Christmas draws near. Then the charming and joyful Ezekiel Norcross begs her to give an orphaned girl a place to say. Olympia Paris never had a family outside the orphanage she grew up in and now manages. 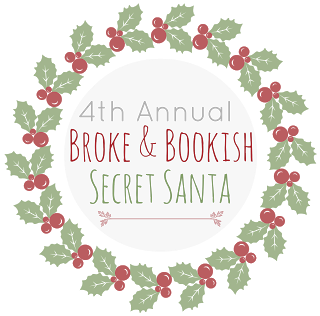 On the brink of another lean Christmas in 1910, Theodore Carstairs arrives with plans to revitalize the town by rebuilding the resort. Too bad he'll have to tear down the orphanage to do it. When funding dries up a month before Christmas, Joy Bennucci declares she'll do everything in her power to keep a transitional home for foster kids operating. Even if she has to turn to modern-day Scrooge Evan Lancaster to do it. Will Christmas be the season of miracles in their lives? 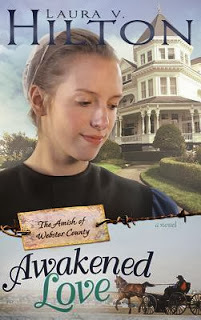 My review: I enjoyed reading these stories and following the house through the years and to see how it touched people's lives. Another thing I liked was the orphan theme and how there was a person and/or people who cared so much about them that they would do anything for them. I can't pick a favorite story because they were all so good. A very enjoyable Christmas story from four authors that are new to me. Synopsis: Fairbrook is a town tailor-made for the holidays with beautiful old houses dotting quaintly named streets like Sugar Plum Lane and Nutcracker Court. But cash-strapped single mom Carly Westbrook worries about providing a merry Christmas for her boys. 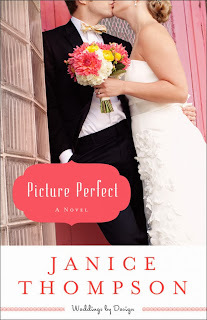 My review: I really enjoyed this book. It was not what I thought it was going to be. The Diamond Lils are a group of friends who find the real meaning of Christmas and you will to as you read this story. Carly was one of my favorite characters in this book and I really felt for her at times. 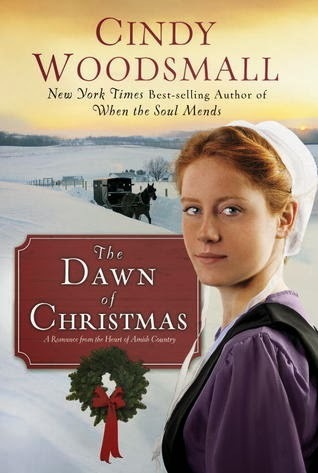 I would like to read more about the people in this town and to find out what happens next with them I think you should give this story a shot as it is a great story of what Christmas really means. I am very glad that I decided to join this swap this year. I had fun shopping for my Secret Santa and today I came home to a nice surprise from my Secret Santa. She was nice enough to send me two different kinds of dark chocolate w/nuts and two books from my wish list. Here are the two books I received. 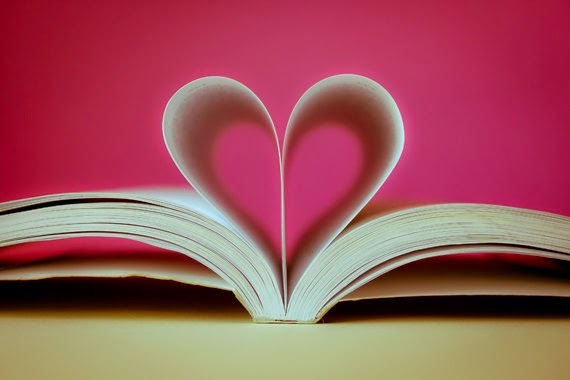 I invite you to stop over at Bev's blog which is My Reader's Block - she has a very nice blog and I am proud to be a new follower of her blog. Thank you Bev for being a nice Secret Santa. 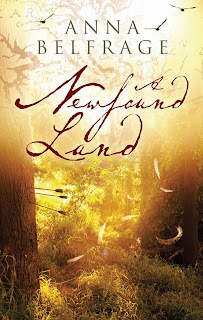 Synopsis: It’s 1672, and Matthew Graham and his family have left Scotland. Having taken the drastic decision to leave their homeland due to religious conflicts, Alexandra and Matthew hope for a simpler, if harsher, life in the wilds of the Colony of Maryland. My review: I have not read any of the other books in this series but I still enjoyed this book. You can absolutely read this book as a stand alone, but I know after reading this you will want to pick up the first three in the series, I know I do. Anna does a good job in developing her characters and making you feel a part of the story. 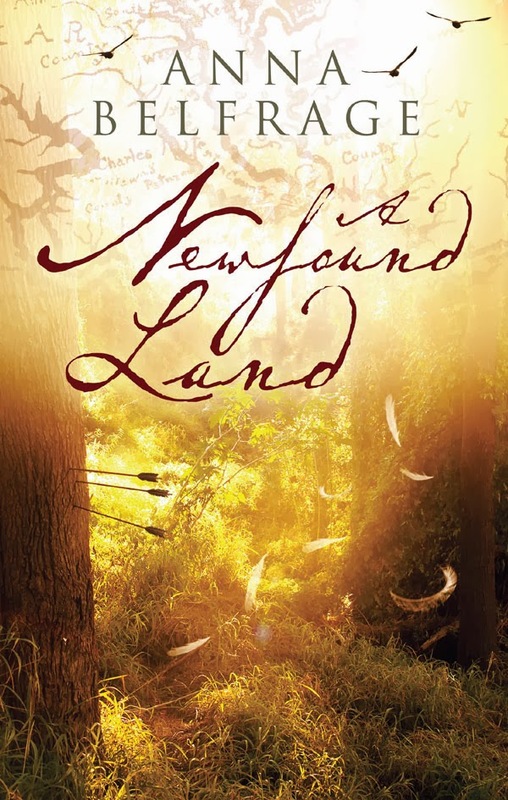 One of my favorite times to read about is when this country was new so this book really grabbed my attention. Another fun this was the time slip aspect of the story, I love reading books where the character goes from the present back in time. It was nice the way the story was told as things really were back then and not watered down at all, it makes the story seem more real as there was a lot of historical detail in the story. To me this makes the story read faster. 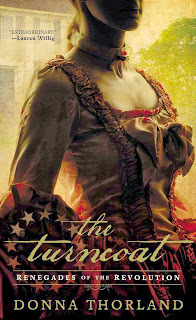 I would recommend this book to fans of Diana Gabaldon. I know I enjoyed it. Be sure to check out the rest of the stops on the tour. 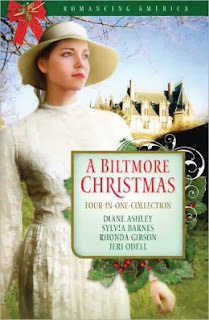 Synopsis: The four orphaned Bradford sisters find employment and romance at the Biltmore estate at Christmastime. Charity's adventure-less life takes a surprising and welcomed turn when she meets handsome Malachi Claybrook. Charity dreams of Clay, but will his true identity make a dream come true romance impossible? A first day blunder has chambermaid Selma falling for a wealthy guest ... and Jacob Sinclair enamored by the lovely servant. Can God help them remove the strict boundaries of their stations to bond them as one? Peggy loves being an assistant cook at the Biltmore estate. But when a trip to the garden for honey brings beekeeper Mark Ludman into her life, will unexpected romance lead to a new lie for an old maid? Melissa is thrilled be following in her sisters' footsteps by working at the Biltmore estate. That is, until it becomes clear that her own talents reside in the stables, not the kitchen. Then she meets Ned Robinson and her tomboy ways begin to soften...but will Ned's proposal end up breaking her heart? Will Christmas be the season of love in each young woman's life? 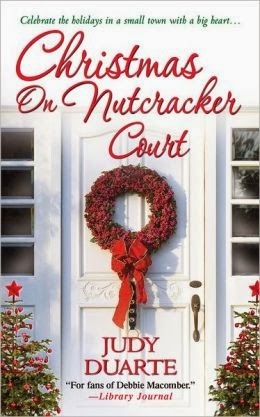 My review: I enjoyed this collection of Christmas stories set at the Biltmore. The stories were not too long so the book read very fast and I finished it in two days. The only complaint I have is I wish each story could have been just a bit longer but that is not really a complaint is it. I enjoyed each sister's story about how they found love. Peggy was a favorite when reading about how much she was respected in her job and I enjoyed reading about Mark, Charity's story was my favorite one to read as I loved Clay, Selma was another favorite story of mine as I also liked Jacob, I even felt bad for him at one point, in Melissa I totally understood her as a tomboy and not thinking she has any talents, I wanted to be her friend. I have always wanted to go to the Biltmore and reading this book makes me want to go even more. I recommend this book for a nice quick holiday read. Synopsis: A solitary artisan. A legacy of bread-baking. And one secret that could collapse her entire identity. My review: This was a new author for me and I was very pleased with this book and look forward to reading more books by her. 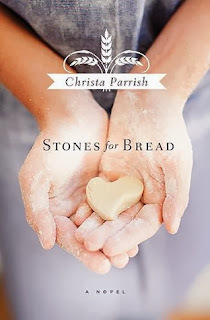 I think Liesl is a very strong woman and her passion for baking really shines through in her story. Because of this I found myself not wanting to put the book down. You will find yourself wanting to read more about Liesl's life and how she gets through all of the things going on. Another thing that was enjoyable to me was the use of bread and baking throughout the book was a neat thing. I like how it was infused throughout. It was nice that there were bread recipes included as well. I will have to try the out as they sound really good. I highly recommend this book. Her friend Charlene Albach arrives at their weekly chick flick night in shock. She's just seen the ghost of Christmas past: her ex-husband, Richard, who left a year ago when he ran off with the hostess from her restaurant. Now the hostess is history and he wants to kiss and make up. Hide the mistletoe! And bring out the hot buttered rum, because the holidays aren't easy for Ella O'Brien either. Ella, newly divorced is still sharing the house with her ex while they wait for the place to sell. The love is gone. Or is it? My review: I have not read the first Icicle Falls book yet but it is not stop me from reading this one nor did I feel lost. 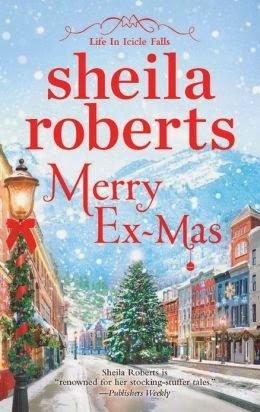 As with the other two books I have read of Sheila's so far I enjoyed this one as well. There were times I did not want to put it down, times I got mad at a character because they would not wake-up so to speak, and even found myself smiling at something that happened in the story. Sheila has a way a writing that you feel at home in the town and with the characters she is writing about. I like how she takes the real problems her characters are having and turns it around in the end for a nice ending. Things may not always turn out the way you want them to but Sheila has a way of showing you how to make the best of it. This was a fun holiday read and I am happy I got the chance to read it. I look forward to reading the rest of Sheila's books I have on my shelf. I highly recommend this and all of Sheila's books to you for you to read and enjoy. Synopsis: This Christmas, experience learning to trust alongside the Plain folk of Apple Ridge, Pennsylvania in this heart-warming tale of second chances. My review: Cindy has another great hit with this Christmas book. I thought it was very interesting that Sadie traveled to Peru for a mission trip. I thought she was a very strong person. Another thing I enjoyed was reading about her and Levi and how their relationship developed throughout the book. I felt bad for Levi and Sadie and felt bad for both of them and understood why they felt the way they did. This was such a good book that you can read it in one weekend. I highly recommend this book as you will not be disappointed. Cindy has a way of writing books so you feel like you really know the characters and feel all of their emotions. Twenty–one–year–old Katie Detweiler loves to bake. When she's hired at a local bed–and–breakfast to do just that, she's excited, especially because the owner promises the shy young woman that she won't have to leave the kitchen. But when her boss's husband requires round–the–clock care, Katie is forced to overcome her shyness and wait on customers, as well. Before long, a "customer" reveals himself to be a private investigator who informs Katie that she was adopted, and that her biological sister needs a bone marrow transplant. A Man on the Run Twenty–two–year–old Abram Hilty has fled the drama of Shipshewana, Indiana, for Seymour, Missouri, where he's staying with his cousin Micah Graber. His plan is to hide, from a girl he no longer cares about—and also from a cold–blooded killer. Uncomfortable sharing his past and afraid of the consequences, he buries his troubles deep inside. When he meets Katie Detweiler, he is immediately attracted, but his pursuit of her is complicated by the problems of his past. An Adventure Unfolds As Katie wrestles with questions of identity, she also struggles to navigate her blossoming romance with Abram, in the face of opposition from a jealous friend. As their relationship becomes more serious, Abram can no longer conceal the truth about his past. But parts of that past rear their heads, barring the way for a marriage between them—at least for now. Through dangers and near–death experiences, Katie and Abram must find their way back to each other. But only the power of forgiveness can bring them together for good. My review: I have not read the other two books in this series but I was able to read and enjoy this book anyway. Although now I will be going back to read the other two. One this that I liked about this book is that it was a page turner and I did not want to put it down as I wanted to know what was going to happen next. I really enjoyed getting to know each of the characters and thought Laura did a great job in developing each of them. If you are looking for a book with some twists and turns then this is for you.